Valiant is proud to announce that X-O Manowar #1 has sold out at the distributor level, rocketing through its initial print run of 45,000 copies. Due to demand, Valiant is going back to press on the first issue of the all-new Valiant Universe for the X-O Manowar #1 Second Printing Wraparound Variant – featuring a never-before-seen cover by rising star Arturo Lozzi! 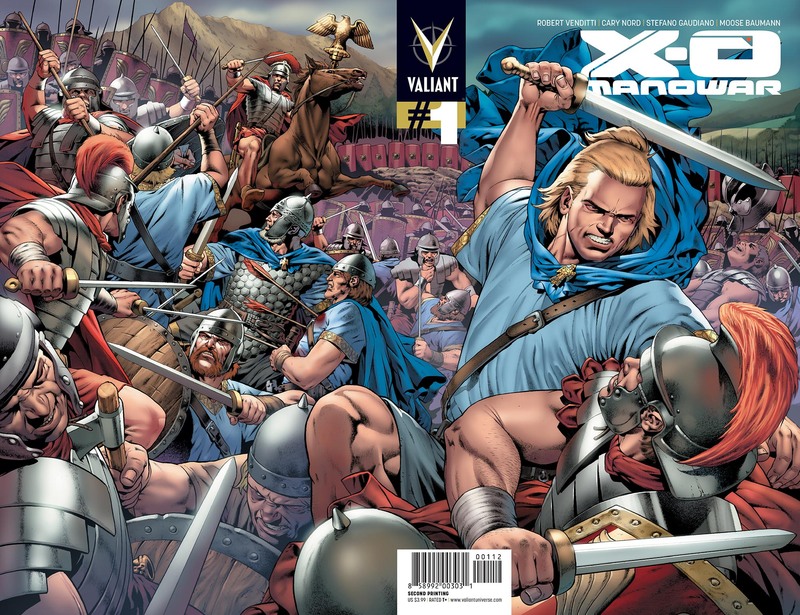 From the creative team of New York Times bestselling author Robert Venditti (The Surrogates) and Eisner Award-winning artist Cary Nord (Conan), X-O Manowar #1 is the first title of the publisher’s summer 2012 relaunch and heralds a new beginning for one of Valiant’s all-time best-selling heroes. And the Summer of Valiant has only just begun! Fans and retailers take note – Harbinger #1 arrives on June 6, and will be followed by Bloodshot #1 on July 11, and Archer & Armstrong #1 on August 8. “This is an outstanding performance for an independent publisher, especially with a debut title. We look forward to great things from Valiant in the months and years to come,” said Bill Schanes, VP of Purchasing for Diamond Comic Distributors, Inc.
Now’s the time to witness the epic beginning of Valiant’s return all over again! Jump onboard the summer’s hottest new series when the X-O Manowar #1 Second Printing Wraparound Variant arrives in stores everywhere on June 20th! X-O MANOWAR #1 SECOND PRINTING WRAPAROUND VARIANT – ON SALE JUNE 20th! X-O MANOWAR #2 – ON SALE JUNE 6th! HARBINGER #1 – ON SALE JUNE 6th! BLOODSHOT #1 – ON SALE JULY 11th! ARCHER & ARMSTRONG #1 – ON SALE AUGUST 8th!